In the Exuma Island chain on a small deserted cay called Allan’s Cay is a colony of the rare black iguanas, called the Bahamian Rock Iguana, or the Bahamian Dragon. 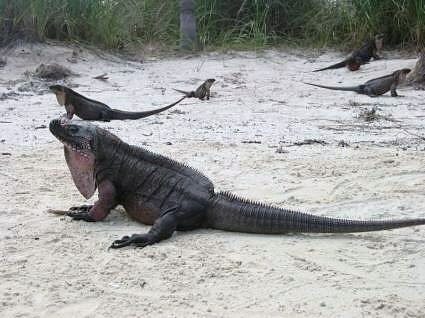 The adults of this iguana subspecies are a dull gray black and can be found on around 7 cays in the Exuma Islands. Allan’s Cay is a easy cruise from Staniel Cay a good location to stop for night on your yacht charter itinerary for the Exuma Islands in the Bahamas, and is actually a group of 3 small islets with an anchorage in the middle. 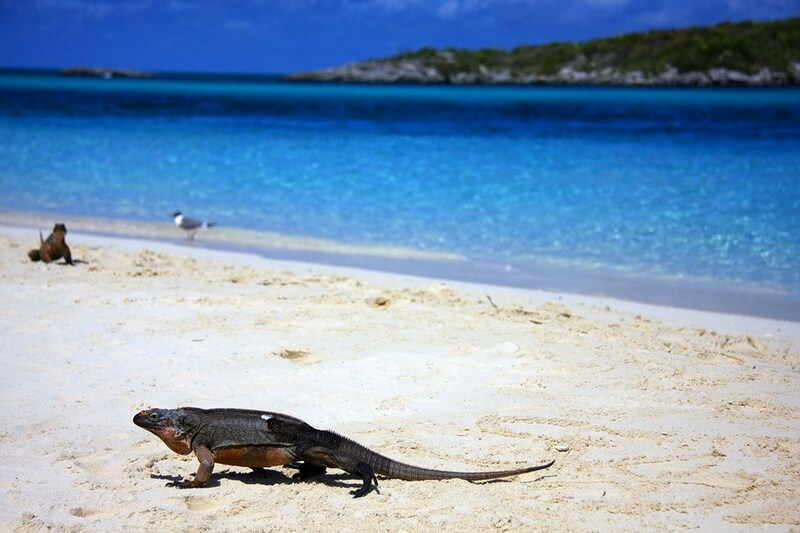 Seeing this rare iguana at Allan’s Cay is a great and easy stop during your yacht charter. There are a large number of iguanas on this cay, and they look forward to visits. Anchoring nearby and taking the yacht tender to the beach usually brings iguanas down to the beach area to investigate. They are surprisingly friendly, however this may be from knowledge over the years that visiting yachtsmen usually bring food, so be sure to bring a snack or two to give to these rare creatures. For a few hours in a morning or afternoon, visiting Allan’s Cay is a very interesting stop on your yacht charter itinerary. How these iguanas came to be here and only here and a few other cays in the Exumas is a mystery. And over time, these iguanas have learned to live together in large groups rather than in the usual territorial manner of other iguanas. Therefore, when you visit, there are a large number of iguanas that you can see, photograph and/or just watch as they seem to need very little personal space, so that a large number of iguanas can be seen with a simply stop on the beach of Allan’s Cay. And no worries, as these iguanas are vegetarians and appreciate a snack of fruit or vegetable, rather than any part of you.Contact Northrop and Johnson Yacht Charters For More Information!